These were all elevated, and wound through heavily built areas. Fascinating to travel on them. Some expressways or some parts of some expressways in Japan are at-grade. Tokufan, mecha enthusiast, transport, architecture and cityplanning fan from Jakarta. Including the ones he was on? The expressways I have seen in Japan don't seem to have many intersections. I guess I didn't see any on that Joban Expy video either, but I may have missed them. What is very common away from the big cities is the existence of two lane expressways. Another amazing part of the roads there are the number of tunnels and large bridges they have. There are tons of Japanese expressway and other road videos on YouTube. In any event, they have plenty of both top notch expressways and dangerous old roads there. I've been to Japan. However, the only time I was on expressways were on a shuttle going between Narita and Haneda airports and vice versa. I was tired and don't even know which roads I was on. My reference to the elevated expressways was in regards to the ones running in the highly urbanized areas of Tokyo and Osaka, and I should have added there are a few underground sections too. I recall a very long tunnel section of what I think was the C2 expressway in central Tokyo. The more amazing part of Japanese roads to me are the narrow mountain roads - many of which are prefecture routes. These are often one lane roads with steep drop-offs. They do seem to have very exciting one-lane mountain roads. I think they work better there than in most western countries because of how small the cars are. Obviously vehicles like buses have some difficulty, but I'd hazard a guess that the Japanese bus drivers are exceptionally well-trained. Probably the Higashi Kanto (to Narita) and Wangan (to Haneda) expressways. Doesn't the Wangan (Bayshore) expy. have tunnels connecting the man-made islands? If I remember right, Yokohama also has an underground section on another expressway in the city center area. The Tokyo-wan Aqua tunnel and bridge connecting Chiba and Kanagawa prefectures is another example in the Tokyo area. is Kobe has a ton of expressway tunnels because it is squashed between mountains and the sea. Therefore, access from Kobe to the main inter-city expressway system required a lot of long, expensive tunnels. Obviously vehicles like buses have some difficulty, but I'd hazard a guess that the Japanese bus drivers are exceptionally well-trained. Yes, fore sure. Here are a couple of examples. What is very common away from the big cities is the existence of two lane expressways. Most new expressways built today are two-lane expressways. They are often built for quite low traffic volumes (less than 10,000 in many cases). Some two-laners built in the 1980s and 1990s are now being widened to four lanes. Japan has a very dense network of expressways, just about any sizable town is connected by expressway. Only Hokkaido has less coverage. I recall a very long tunnel section of what I think was the C2 expressway in central Tokyo. That's the Yamate Tunnel, it opened in two phases (2007 & 2015) and is currently one of the longest road tunnels in the world. The tunnel length for through traffic is 18.2 kilometers. The complete tunnel length is 19.3 km because the Ohashi Junction with the Shibuya Route is offset from the main tunnel. There's also a 9.5 kilometer tunnel under construction as part of the Tokyo-Gaikan Expressway on the east side of Tokyo. Quoting my father here: "Japanese drivers are very respectful, they're even better than Chambersburg drivers!". Go to the United States, and every freeway is complete carnage. Japan has recently assigned numbers to its expressways; before then, most expressways outside Tokyo were known only by names. The Ministry of Land, Infrastructure, Transport and Tourism explains this in Japanese, English, Chinese and Korean. The motivation: help foreign visitors find their way around, especially as the 2020 Olympics are approaching. The "E" numbers for expressways (such as E5 for the Hokkaido) resemble the European E-Road system. "C" prefixes are used for a few circular routes. "A" suffixes are used for a few auxiliary routes. 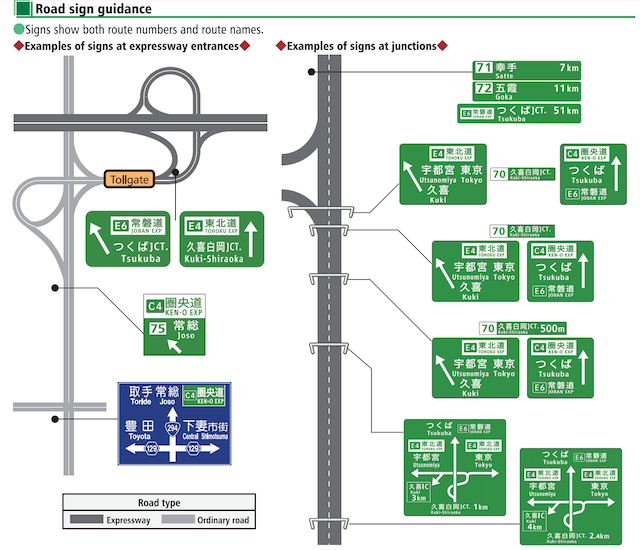 Here's a 2-page PDF in English (http://www.mlit.go.jp/road/sign/numbering/en/file/numbering_leaflet_en.pdf) with a map and list of route numbers and guide sign examples. Notably there will not be cardinal directions on the signs; the practice of listing destinations instead will be continued. They were doing great until the very bottom of page 2, where they list expressway "C A", Tokyo-Wan-Aqua-Line Expwy, Aqua Renraku Expwy. 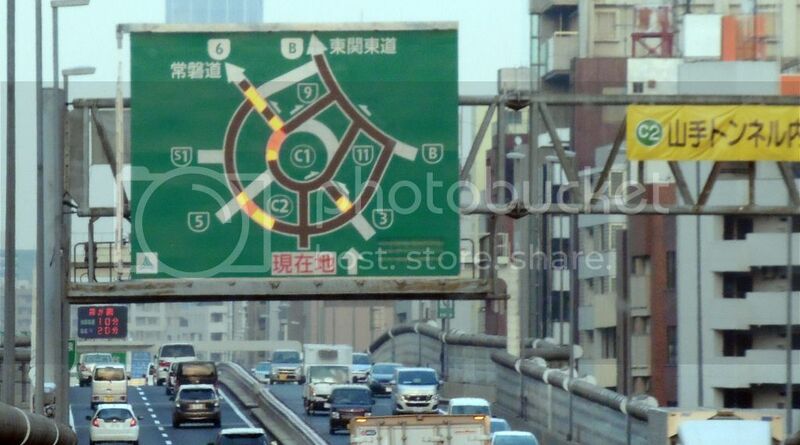 Not being very familiar with Japan's system, does this give numbers to all expressways that are not city-numbered? Or are some minor ones omitted? Maybe some stubs are left out; but comparing the current system (http://www.mlit.go.jp/road/road_e/q3_highway.html) with the new numbering map (http://www.mlit.go.jp/road/sign/numbering/en/file/numbering_leaflet_en.pdf), it looks like the coverage is nearly complete. why gates in ETC only lanes??? Do they any mid speed and any high speed ETC lanes in japan? IIRC, Japan is a long time user of tolls to finance and maintain their expressways. It would not surprise me if the infrastructure has not yet caught up to some of the Western countries, in terms of permitting high-speed toll collection. I do remember a scene from a Top Gear Episode from 2008 of Jeremy Clarkson racing across Japan. He came to a toll booth and sped through at probably 30 mph. The arms raised just in time. He exclaimed that you could "win Wimbledon with arms like that". It's also possible that the expressway that NE2 posted a photo of (the Keinawa Expressway) was built before Japan started using high-speed toll collection. I found a 38 km full freeway that wasn't assigned a number; it appears to be signed in places as federal Route 2 but so is the old surface road. If you continue east it becomes a toll road that was assigned E93 (and then becomes pre-existing Hanshin Expressway Route 3 where maintenance changes). I'm not impressed. France also uses gates on ETC lanes. You can drive 30 km/h through those marked as such, but you need to come to a near stop on toll gates with no dedicated ETC lane. The reasoning in France being that otherwise they cannot bill foreign drivers avoiding the tolls. I don't think that applies to Japan where there are virtually no foreign vehicles on the road. The expressway numbering is in addition to a few urban systems which already had numbered expressways. Expressways suffixed with an 'A' are alternate routes, these tend to run parallel to the oldest expressway. 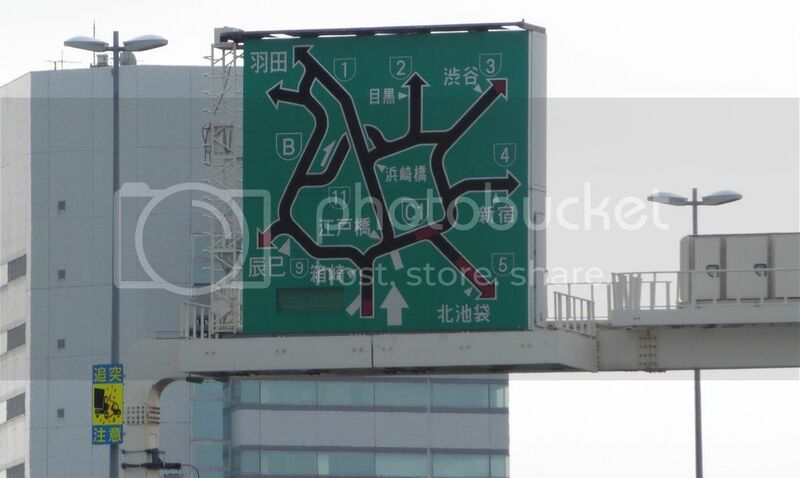 Don't be fooled by the 'alternate' description, many alternate routes are among the longest expressways in Japan. For example E2A is the Chugoku Expressway which is the second-longest expressway in Japan. C-routes are circular routes. C3 and C4 are in addition to C1 and C2 of the Shuto Expressway of Tokyo, so C3 is the third ring road and C4 is the fourth - also known as the Ken-O Expressway. Only Tokyo and Nagoya have numbered C-routes. Numbering ranges are generally clustered in the same region. Most regions have multiple ranges of numbers. E numbers are also assigned to super two expressway, which are increasingly common in Japan, especially in interior of Honshu and on Hokkaido, where traffic volumes are lower than on long-established corridors between the largest cities. Japan builds these super two expressways for traffic volumes as low as 2,000 vehicles per day.